I finally finished this bad boy last week, and cannot believe how amazing the book was! It took me a while to get into it, having never read anything by Dan Abnett before, but last week polished off pretty much two thirds of the novel following a conversation at my local store that got me hooked into the whole 30k universe! The Horus Heresy has been called the single great story of the Warhammer 40k universe, though it has always previously been told in snippets rather than the whole tale laid bare. We know the main points – SPOILER ALERT! – that Horus turns traitor and tries to depose the Emperor of Mankind, but is defeated and cast into the Eye of Terror. But that’s been pretty much it for so long! Now, however, the wonderful people of the Black Library have been working to tell the story in its entirety, with 27 full-length novels and five story compilations in print at the time of this writing. The first story in the series is Horus Rising, first released in April 2006. The challenge with this kind of undertaking is simple; how do you make a story interesting, when people already know the ending? I must say, I was totally blown away by Dan Abnett’s story here. So many of the cliches of this type of prequel-like story are completely done away with, and while there is some foreshadowing of future events, in the main we have a fairly straightforward story set 10,000 years before the stories of Warhammer 40k, where Warmaster Horus is actually a genuinely nice and likable guy. Heck, even Abaddon, later to be known by the sobriquet ‘the Despoiler’, is a fairly nice guy. The story is primarily told through the eyes of Garviel Loken, captain of the tenth company of Luna Wolves, the XVI Legion of Space Marines under the command of Warmaster Horus. The story begins as a group of ‘remembrancers’ are brought aboard the legion’s flagship, Vengeful Spirit, to document the progress of the Emperor’s Great Crusade to tame the galaxy and unite the scattered bands of humanity. The Emperor himself has retired to Terra, leaving Horus, his favoured son, as Warmaster in command of the Crusade. We follow the Luna Wolves as they attempt to bring the planet simply called Sixty-three Nineteen to compliance, after its ruler (the self-styled “emperor”) has been deposed. Some pockets of resistance are neutralized in the wilderness, where Loken learns of the pagan beliefs of the indigenous population, and comes face-to-face with the terrifying power of the Warp. We then move to follow the Emperor’s Children, the III Legion, where a task force is attempting to rescue a detachment of Blood Angels (the IX Legion) on a world simply known as Murder. The Emperor’s Children, led by Saul Tarvitz and Lucius, encounter a strange arachnid race that fights without mercy, and they are nearly destroyed before the Luna Wolves show up to rescue them. Horus and his legion then proceed to wage war on the arachnids until the intercession of the Interex, a human culture overjoyed to find cousins from Terra. They explain they had confined the arachnids to the planet, an action Horus and his space marines find aberrant, having themselves been tasked with the extermination of all xenos races. The Luna Wolves proceed to Interex space to discuss merging into the Imperium, but everything goes wrong when a weapons museum is attacked. The Interex blame the Luna Wolves, fearing they have fallen to Chaos, and Horus barely makes it off the planet. 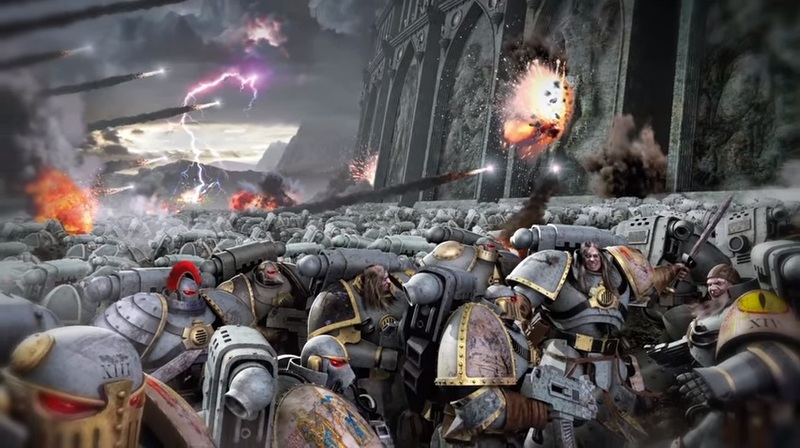 The books ends with several scenes that set up future novels, including the renaming of the Legion as Sons of Horus, the ‘lecitito divinitatus’ – belief in the Emperor’s divinity – taking root, and the revelation that the weapons museum was attacked by First Chaplain Erebus of the Word Bearers, who has stolen a semisentient weapon. I cannot praise this book enough. It took me a while to get going, largely because I found Abnett’s writing style to be a bit haphazard at first, with the internal timeline not always clear at first. I put this confusion down to reading this book in snatched moments – the problem was much less pronounced when I read Part Two in one sitting. The characters are really compelling, with each captain of the Mournival – Horus’ personal advisers – really rounded out, and the Warmaster himself, as mentioned, coming across as actually a nice guy. The Interex was an interesting part of the story, and one that I wish had spent more time exploring, and the finale is really explosive, particularly with the revelation of Erebus’ treachery. Indeed, I finished the novel and immediately went to my local GW to snap up the second book, False Gods, which I have currently read the first part of. The series has been wonderfully set-up with this novel, the first in an opening trilogy, and I would recommend this to anyone, particularly in light of the fact Games Workshop appear to be moving into an entire range of plastic 30k figures.